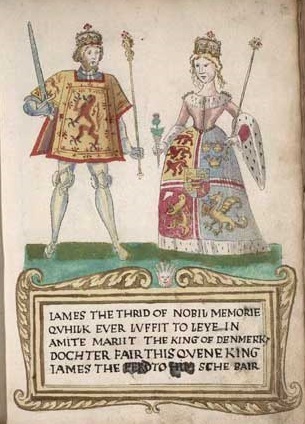 In 1469 Shetland was pledged to Scotland as part of a marriage treaty between the royal houses of Denmark and Scotland. King Christian I was 10,000 florins short of the money due to the King of Scotland as a dowry and Orkney and Shetland were used to plug the deficit. Although the Norwegians tried repeatedly to redeem the Northern Isles, Shetland was henceforth treated as part of the Kingdom of Scotland and in 1472 the administration of the Catholic Church in Shetland shifted from Nidaros (Trondheim) to the new archdiocese of St Andrews. Today the Shetland Islands form a single parish but in the Middle Ages there were about thirty major churches and another ninety or so chapels (not all necessarily functioning at the same time) divided into some fifteen priest's districts. 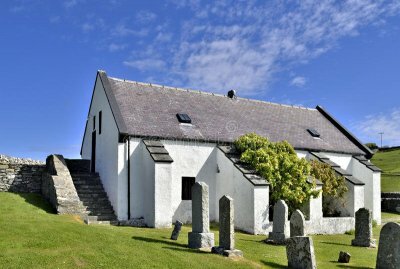 Only one medieval church remains in use, Lunna Kirk in the north mainland, near the ferry port for Whalsay. This had survived as the burial chapel of the Hunter lairds and was made into a Presbyterian kirk in 1753. It is a simple rectangular church, probably constructed in the late middle ages and originally dedicated to St Margaret. Shetland was never the seat of a bishop but the senior clergyman was the Archdeacon of Shetland who originally resided at St Magnus' Church, Tingwall. 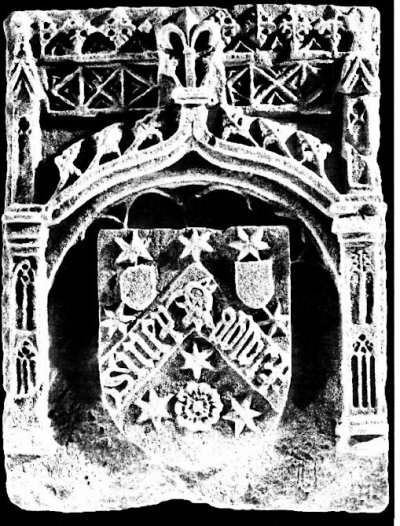 Nothing survives now of the medieval church there but in 1985-87, during the excavation of a tithe barn at Kebister, an armorial stone bearing the arms of Henry Phankouth, Archdeacon of Shetland (1502-1529) was discovered and can now be seen in the Lerwick museum. Research by Shetland's archivist, Brian Smith, has revealed something of the background of this stone - and with it a slightly unflattering picture of the late medieval church. Henry Phankouth was the illegitimate son of Andrew Pictoris, a German academic who in 1477, when Henry was seven years old, became Bishop of Orkney. The young Henry Phankouth was sent to study at Cologne University before he was legitimated by his father and ordained to the priesthood. He was only 32 years of age when appointed to this second most senior post in the diocese and remained resident in Orkney throughout the 27 years of his tenure. It was at least a sign of Shetland's continuing ties with continental Europe. 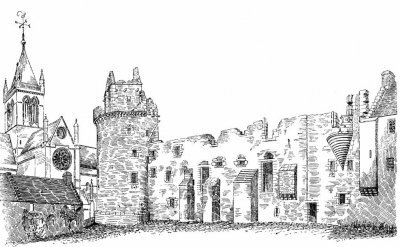 The Cistercian monk Robert Reid, who was one of the last Catholic bishops of Orkney (1541-1558), was a Renaissance patron of the arts and while Abbot of Kinloss Abbey in Moray had invited the Italian scholar Giovanni Ferreri to Scotland. Bishop Robert Reid extensively remodelled the Bishop's Palace in Kirkwall, but it is impossible now to say what influence he had on the Catholic church in Shetland, the northern half of his diocese. The Scottish Reformation came in 1560. 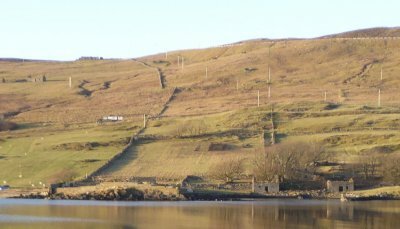 It took time to become established in Shetland and seven years after the official establishment of Presbyterianism the whole of the southern half of Mainland, from Quarff to Sumburgh Head, was served by only one lay-reader. Presbyterianism was not really effective here until 1700 when a committee was appointed by the General Assembly of the Church of Scotland to enquire into the spiritual state of the islands. 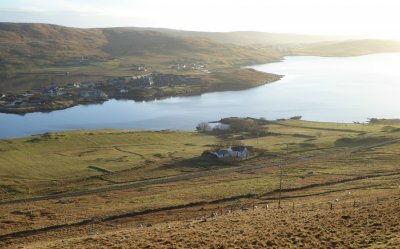 We do not know when the last Catholic priest stopped ministering to the people, or when the last Mass was said, but there is now a gap of some three hundred years before the history of the Catholic Church in Shetland resumes. If you would like to receive our newsletter please enter your e-mail address in the box below. You will need to confirm your address by responding immediately to the e-mail you will be sent. © 2019 St Margaret's RC Church, Lerwick. All Rights Reserved.